Hi everyone! Ready for round two of our Disney weekend during the hottest days Orlando had seen yet? Me too! Our second day in Orlando was bright, sunny and hot. Everyone rose later than normal after the previous night’s activities til 2 or later, but by 11 AM we were all up and having coffee. A couple of hours after that we were ready for brunch, and Terry and Jen directed us to this excellent little diner in Celebration’s town center called, The Market Street Cafe. It was so good in fact, we ended up going there for lunch both Saturday and Sunday, even though I never even made it past the breakfast menu both days. Sean and I shared pancakes and an omelette the first time and French toast and a breakfast burrito the next time, and both were fantastic. Really big portions too – I was stuffed! This entire weekend was giving in to gluttony at nearly every turn. When we finally got done with our leisurely lunch, we swung by the Raw Threads Showroom for a few hours, so Jen could help Kate and Andrea mind the store for at least a bit. I got a good chance to examine more of her great designs and help with the Facebook page strategy (it was a great feeling to actually have some business experience – i.e. being a content strategist at a digital ad agency as my day job, that was relevant in a real-world situation for once). 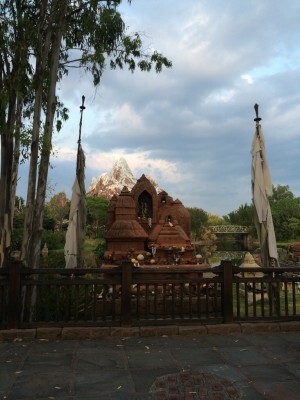 The newest roller coaster at Disney’s Animal Kingdom: Expedition Everest. The heat of the afternoon finally started to pass later that evening, and we decided to hit Disney’s Animal Kingdom for a couple of rides and the best barbecued ribs around was a splendid idea. When we got there, the park was only open for a couple more hours and the bedraggled-looking families were struggling back towards the parking lot. Having fun yet, kids? This was perfect for us though, we rode the Animal Kingdom’s newest roller coaster, Everest, twice in a row then got dinner and had a pavilion down by the water all to ourselves. And the ribs? They were pretty darn good, if I do say so myself. The night was still young though, Hollywood Studios was open later, and Terry was dying for Sean to see Hollywood Studios, mostly for the new Star Wars section that had been created since Disney purchased the rights from George Lucas. I’ll be honest, I’d been to Hollywood Studios when it was still MGM, and I couldn’t remember much about it, but nothing looked familiar when we entered it that evening. It looked like a giant, living-ad for ABC shows and upcoming Disney movies, while being a theme park simultaneously. We passed by American Idol, giant Mickey Mouse magic hats, a miniature version of the Titanic and then came upon Star Wars. Wow… the Star Wars section could easily occupy its own park soon, that’s how much stuff and loyalty revolves around that brand. Between the rides (Star Tours), the multiple gift shops selling anything and everything Star Wars related, the Star Wars photo-op spots (ride your own speeder) and the Star Wars characters on display – Disney was certainly making a good return on its initial investment already. 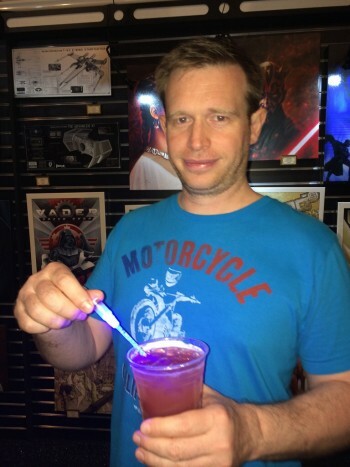 In one of the gift shops, appropriately titled, Darth Mall, there was a full bar, where Sean got a “The Force” drink complete with tiny, light up light saber. I kid you not – I kept the light saber in fact. Sean was very happy with his Star Wars themed drink. I loved the tiny LED light saber. We had just enough time to ride a Star Tours ride (all the others had lines out the wazoo), check out the gift shops and then we were on our way back through the park to the entrance to pick up our car. Honestly, I can’t think of a better way to do Disney than we did. Avoid the crowds and the heat of the day, and hit up the parks at night for the best experience by far. The next day, rain was threatening in the afternoon and evening, and the newest X-Men movie had just come out, so Sean suggested going to see it at a theater in Downtown Disney, which we hadn’t visited yet. We saw it at an upscale AMC that served drinks and decent food during the movie and had giant comfy seats, which I very much appreciated. It also helped that the movie was pretty good, in my humble opinion. Afterwards, we tried to go to one of the Disney resorts for dinner. Sean remembered a restaurant at the Polynesian being very good and I was game, so we gave it a try. Major mistake. We got there and the place was beyond packed with people waiting for tables, we decided to try to get to another resort for dinner but after riding the monorail to the Contemporary, waiting for a non-existent ferry and the rain beginning again, we threw in the towel and headed back towards Celebration. This actually turned out to be a good decision though, because we finally ended up at a fantastic Cuban restaurant named, Columbia Restaurant (very original name, I know), and I had some of the best paella I think I’ve ever had. I highly recommend you try it, if you’re ever in the area. In the end, we definitely got a good meal, which is what counted. 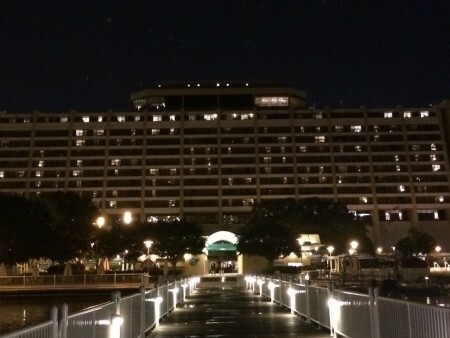 The Contemporary Resort, man this brings back memories of my childhood. Our last day, we hung out with Jen and Terry until early afternoon, had a great lunch at an Italian restaurant in Celebration called, “Cafe D’Antonio” (great calamari and grilled pizza), and then hopped back on the highway to head home. Almost the same as when we drove down Friday morning, we encountered traffic but no slow-downs, accidents, construction, etc. I was amazed, honestly. We got back to Atlanta Monday night, tired and a little stiff from the long car ride, but otherwise great and much refreshed from our little getaway. A giant thank you to Terry and Jenny for opening your home to us both for the weekend and being our personal tour guides, as well. Sean and I had such a good time, and it was so, so nice to see new sights. To me, Disney still holds the magic that every kid loves – it may be hot and trying at times, but it’s still an experience unlike any other. And next time we’re down in Florida… Universal Studios! This entry was posted in Florida, North America, United States of America and tagged Animal Kingdom, Disney, Florida, Hollywood Studios, Light saber, North America, Orlando, Star Wars, Travels, United States of America on July 21, 2014 by Paige N..